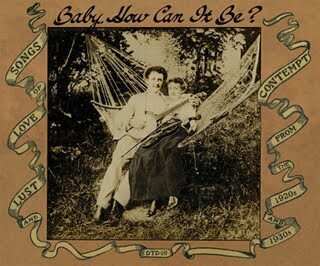 Lucindaville: Baby, How Can It Be? With Valentine's Day looming, we would like to suggest the perfect gift for those y'alternative tune lovers that you love. This is another great compilation by those cooler than cool folks over at Dust-to-Digital. You may remember a post we did on another Dust-to-Digital favorite, Take Me To The Water. Well, now that we are out there looking for just the right gift for our loved ones (or even if we are just in the mood to love ourselves) give Baby, How Can It Be? a try. "The three disc collection is culled from the record collection of John Heneghan and features everything from Appalachian folk and Dixieland jazz to Hawaiian ballads and cowboy songs. Virtually every form of roots music can be found here, from artists as well known as Uncle Dave Macon and Cab Calloway, to those such as Henry Thomas who should be familiar to devotees of the eras music, to complete unknowns like Hazel Scherf and Davey Miller... In short, the set provides hours of great, rarely heard music from the Golden Age of Recording and would be the perfect gift for the roots music fan in your life." What more can I say. Come on, EVERYBODY gives flowers and candy -- Be original and give the gift of music. Music is a great gift for a loved one. If only I could sing well.. I would always sing a song for them.